The top of one plant, the scion, is melded with the rootstock of another. Essentially, the breeder gets to choose the best qualities from two plants. With tomatoes, the scion is chosen for the flavor and quality of its fruit, and the rootstock selected for vigor and disease resistance. NOW THERE’S something new in tomatoes besides a bigger beefsteak or juicier heirloom. Grafted tomatoes, including plants with two kinds of fruit growing on a single rootstock, hit the market this spring. Grafting is simply a manual method that fuses the tissues of one plant with those of another. It’s an age-old horticultural practice, a way that people have meddled in plant reproduction since the Chinese grafted peach trees in 5000 B.C. Roses, fruit trees and grapes are usually grafted, as are many other woody plants we grow without ever noticing. Because grafted tomatoes have proved more effective at taking up water and nutrients, they are tougher. Tougher tomatoes are better at withstanding disease, pests and temperature fluctuations. This means a higher yield of larger tomatoes. Perhaps most important in our climate, grafted tomatoes can be harvested over a longer period of time. Could this mean that summer’s race toward ripeness might actually be won, even in chillier, wetter years? Doyle became enamored with the idea of grafted vegetables for the home gardener after visits to Crete and India, where the practice is mainstream. “It’s become a worldwide movement,” she says, “because grafting produces more food with less chemicals on less acreage.” Log House Plants began growing, trialing and selling grafted tomatoes last summer. This year they’re debuting 33 kinds of grafted tomatoes as well as eggplants and peppers; still to come are grafted cucumbers, squashes and melons. It takes a high level of skill to graft a plant as small and tender as a baby vegetable. The technique used at Log House is called tube or Japanese top-grafting. It’s relatively simple, but conditions must be controlled to prevent stressing the vulnerable, newly grafted plant. Each tiny tomato is painstakingly clipped, cut and nurtured in a healing chamber that ensures the perfect temperatures, humidity and light to heal its grafting scar. Such precise treatment is costly; in nurseries, grafted tomatoes sell for $12.95 a gallon, and $19.95 for doubles, which means two kinds of tomatoes grafted onto a single rootstock. How to care for these grafted wonders? Keep the graft well above the soil level and remove any suckers that form below the graft, or roots that emerge above the graft. Because these are the Hercules of vegetables, be sure to prune, stake and cage them to direct and support all that vigor. 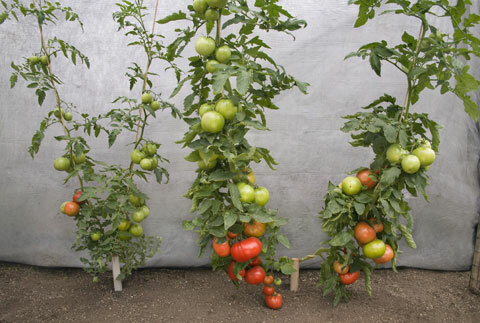 Doyle recommends growing grafted tomatoes in the ground rather than pots, where their extensive root system has space to spread out and support the plant’s lively top growth. Doyle won science-fair competitions when she was in school, which might explain why she delights in grafting two tomatoes onto one rootstock. What could make better use of garden space? With grafted tomatoes it’s strategic rather than freakish to harvest both golden ‘San Marzano’ and red ‘Viva Italia’ roma tomatoes from one plant. Cherry tomatoes, ‘Sungold’ and ‘Sweet Million’ have been grafted onto one rootstock, and the heirloom ‘Brandywine’ shares root with the roma ‘Super Marza.’ Double grafting may be Doyle’s most successful science experiment yet, and our gardens, health and dinner tables will benefit from it.